Where Is My Medical Tricorder? If not the medical tricorder from Star Trek, when could we possibly see diagnostic equipment capable of scanning for infections, viruses or impending heart attacks, attached to wrist watches or other portable devices? Nothing against the phaser, but for many of us the most coveted piece of away team equipment is the tricorder, the medical version of which can perform a complex examination in a single whistling pass over a patient. If you've ever tried to lie perfectly still in a thumping MRI machine or sat in a doctor's office waiting for lab results, you've longed for faster, more portable diagnostic devices. 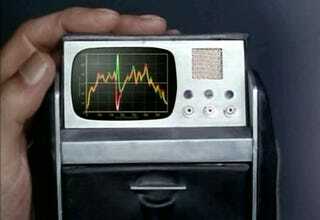 If you're interested in your EKG or your glucose level, you may have to find a tricorder ringtone for your iPhone. Wearable heart monitors with Bluetooth are well on their way to market. Not only could a doctor remotely monitor a patient using a PocketPC such as the Alive EKG (at left), there's no reason why a patient's bluetooth-enabled cell phone couldn't be used to automatically alert a physician in case of emergency, too. Impressive as that is, I'm a firm supporter of devices with lasers over devices without lasers. This laser digitizer (below), when attached to a PDA, can be used to record the width and depth of a healing wound - helping doctors and nurses better track patient progress. The PDA, called the ARANZ Medical Silhouette, can then be used to upload measurements and images into a patient file. I challenge anyone to use this device without feeling like you are living in the future. Not every portable monitoring device needs to be quite so high tech. Patients in rural areas and the third world often do not have physical access to doctors - but for many applications, they might be able to do without. The CellScope (at left) aims to turn an ordinary cell phone camera into a "telemicroscope" capable of sending high-magnification images of skin or blood samples to a doctor for remote diagnosis. An inexpensive alternative to a long trip for a routine diagnosis, and the speed at which the information can reach a physician makes this a potentially valuable tool for keeping real-time track of disease outbreaks. The gold standard for infectious disease monitoring in patients is usually a blood test for a biomarker molecule of some sort. While we can't yet wave a device over someone and know that much about the contents of their blood, we may be soon be able to miniaturize the equipment necessary to perform the analysis. Electronic noses, for example, may soon be able to diagnose diseases by smell (with a little help from a layer of artificial mucus) - if a dog can be trained to smell cancer on a patient's breath, why not? Microfluidic lab-on-a-chip technologies (pictured below) can already be used to determine the presence and extent of gum disease by testing for biomarkers present in a few microliters of saliva. Researchers aim to pack everything the device requires into a 5-pound package, and to develop similar chips for other diseases. If you'd like to avoid getting the disease in the first place, real-time infectious disease monitors can be used as an early-warning system, with prototypes currently capable of detecting the presence of the avian flu virus. While there's plenty of tweaking to do before these silicon chip-based sensors are installed in hospital air vents or worn by soldiers in the battlefield, the alternatives to early detection range from a mild fever to coughing up blood - followed by extensive tests to reveal why you have a mild fever or are coughing up blood. Far better to know what's coming so that we can limit exposure and treat the disease as early as possible. If these possibilities aren't tantalizing enough to interest you in medical miniaturization, keep in mind that Gene Roddenberry inserted a clause into his contract stating that anyone who can build a tricorder can use that name to describe the device. One company has already combined an EMF meter, light and colorimeter, barometer, thermometer, and clock into a tricorder, but the medical version is as of yet unrealized. If you succeed, a warning - reversing the polarity on any of these devices is more likely to bugger its electronics than allow it, like most technologies on Star Trek, to perform impossible feats critical to the plot. Terry Johnson is a biology researcher at UC Berkeley and io9's resident biogeek. If you have a question you'd like Terry to answer, email him at: tdj@io9.com.